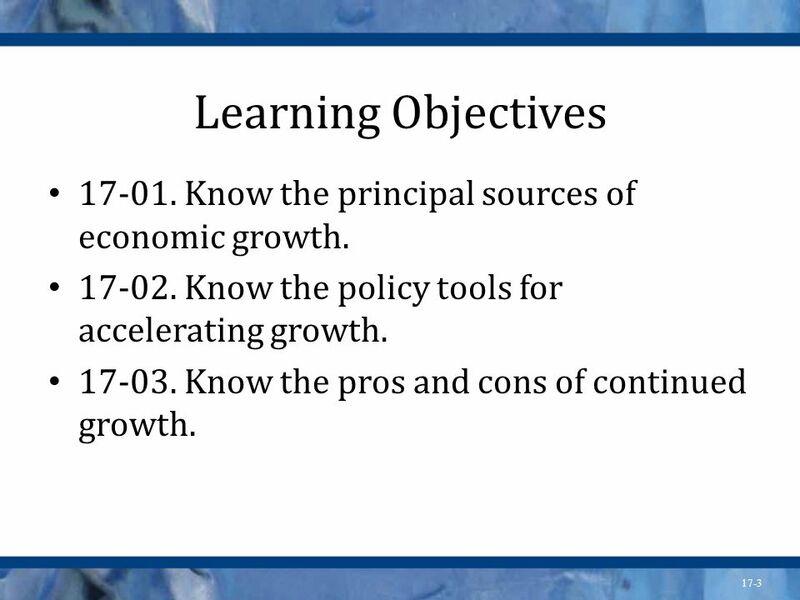 3 Learning Objectives Know the principal sources of economic growth. Know the policy tools for accelerating growth. Know the pros and cons of continued growth. We will use these objectives to review the chapter. The production possibilities curve (PPC) shows our short-run limit of production capacity. 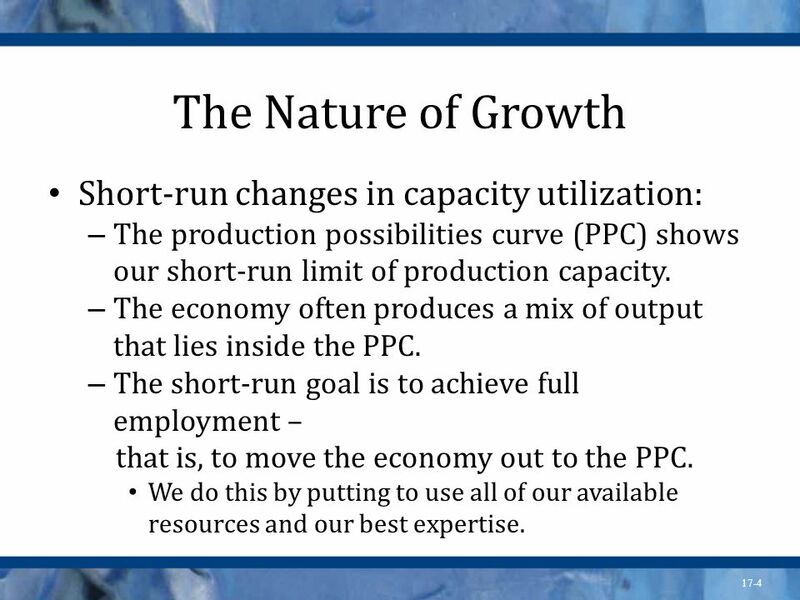 The economy often produces a mix of output that lies inside the PPC. The short-run goal is to achieve full employment – that is, to move the economy out to the PPC. We do this by putting to use all of our available resources and our best expertise. It might be instructive to draw a PPC on the board and identify a point inside the curve. The short-run goal then could be demonstrated by a move out to the PPC. To achieve large and lasting increases in output, we must push the PPC outward – that is, to increase our productive capacity. Economic growth: an increase in output (real GDP); an expansion of production possibilities. 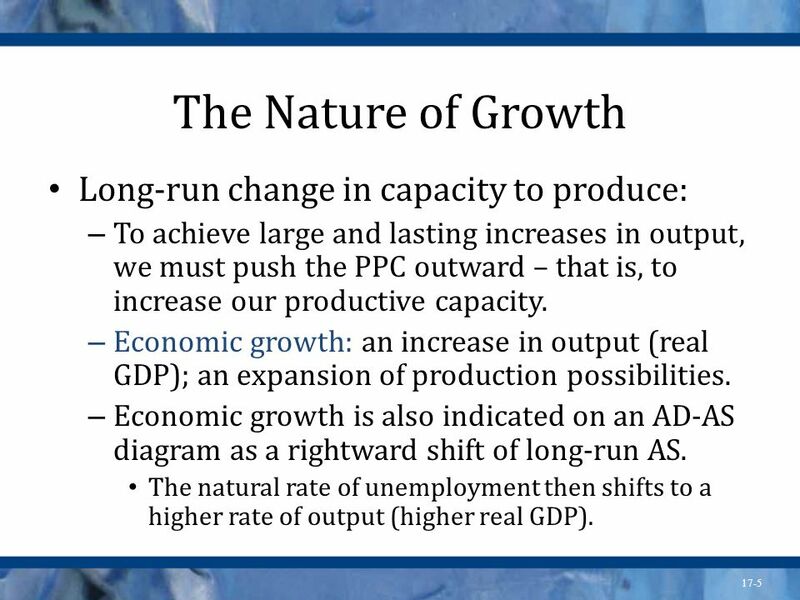 Economic growth is also indicated on an AD-AS diagram as a rightward shift of long-run AS. The natural rate of unemployment then shifts to a higher rate of output (higher real GDP). On the same PPC, push the curve outward into the previously unattainable area. Identify a point on the new PPC. Compare the output from that point to the output at the point on the original PPC. Now draw an AD-AS diagram with a long-run vertical AS curve. Demonstrate growth here by pushing the long-run AS to the right. Short-run AS will shift to the right along with long-run AS. 6 Measures of Growth Growth rate: percentage change in real GDP from one year to the next. Economic growth is an exponential process. Small changes compound from year to year. 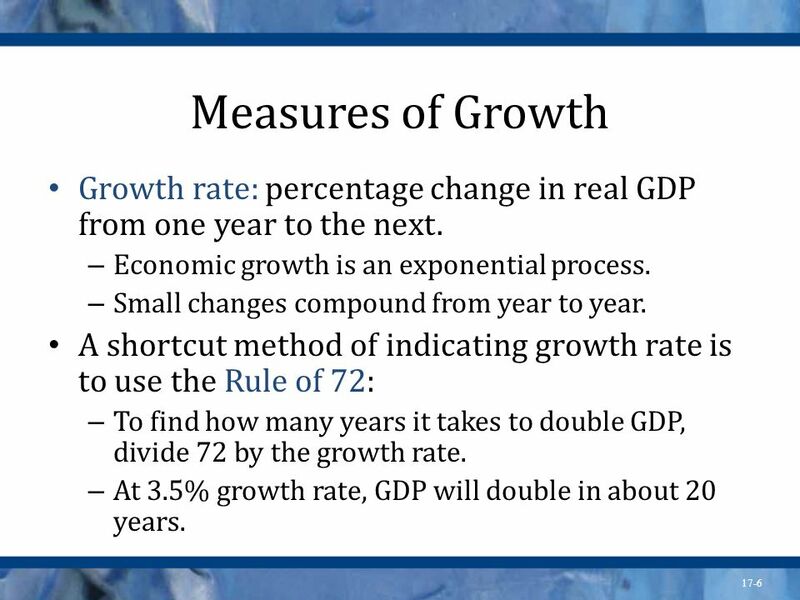 A shortcut method of indicating growth rate is to use the Rule of 72: To find how many years it takes to double GDP, divide 72 by the growth rate. At 3.5% growth rate, GDP will double in about 20 years. The rule of 72 is a simple technique. How long would it take to double the money in an account that pays 8% compounded annually? 72/8 = 9 years. 7 Measures of Growth GDP per capita: total real GDP divided by total population. This is a measure of living standards. It increases only when GDP growth exceeds population growth. 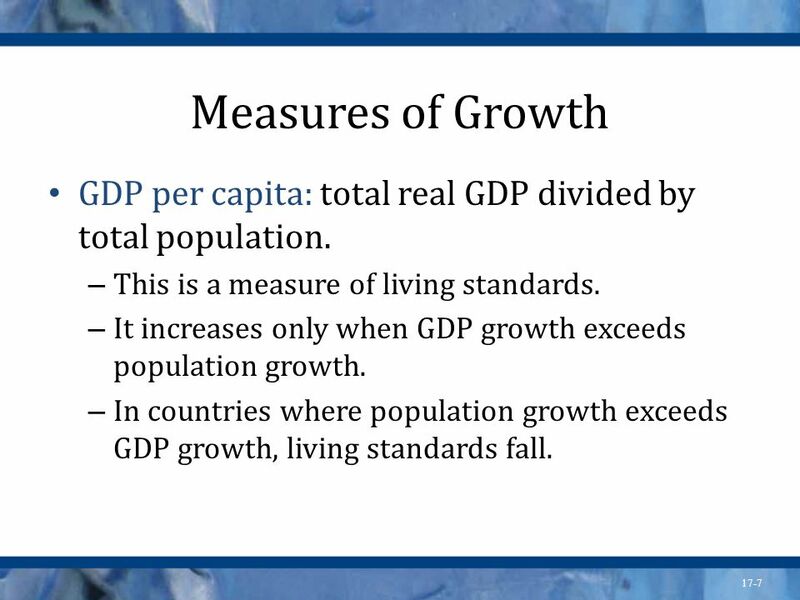 In countries where population growth exceeds GDP growth, living standards fall. It might be useful to crunch a few numbers on the board to illustrate this. 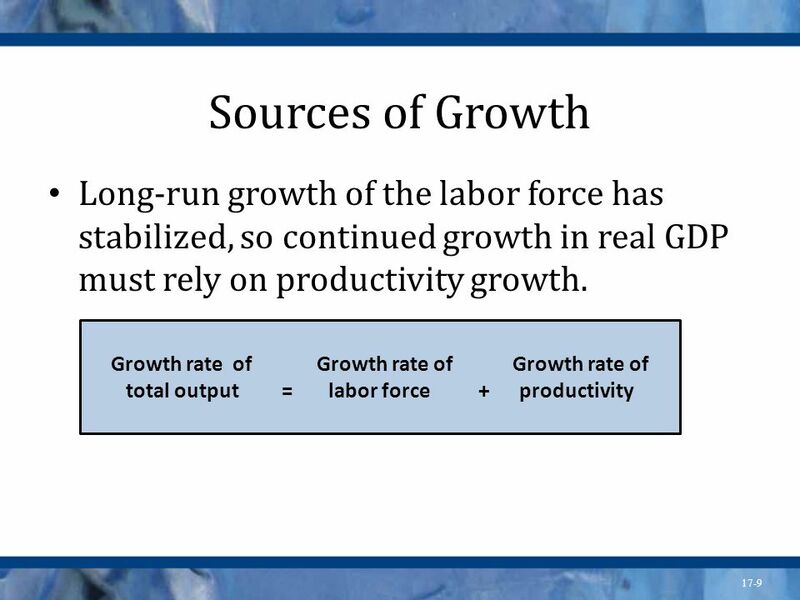 8 Measures of Growth GDP per worker: real GDP divided by the labor force. A measure of productivity. If the labor force grows faster than the population, GDP per capita grows and living standards rise. Productivity is better measured by output per labor-hour. 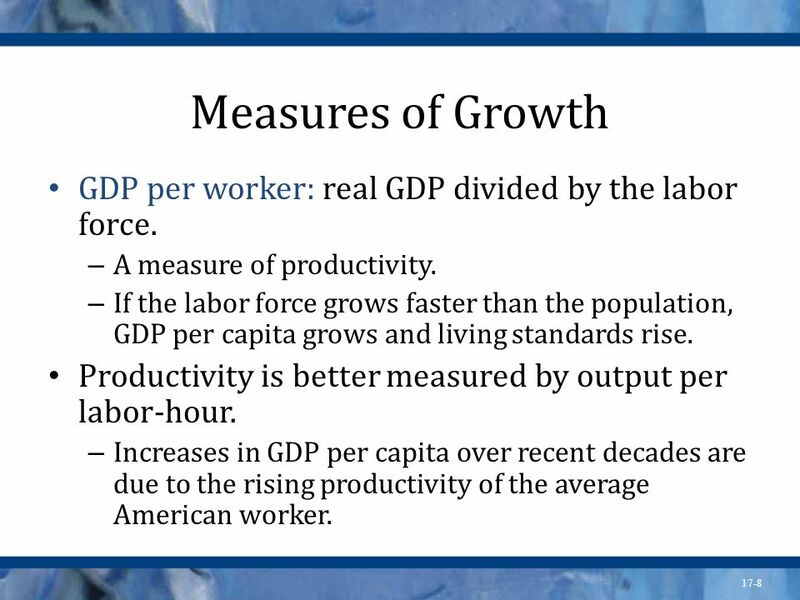 Increases in GDP per capita over recent decades are due to the rising productivity of the average American worker. This is the same idea but focuses on production. Not everyone in the population is a producer, but we all are consumers. 9 Sources of Growth Long-run growth of the labor force has stabilized, so continued growth in real GDP must rely on productivity growth. Growth rate of Growth rate of Growth rate of total output = labor force productivity The mix in the labor force continues to change: more women and minorities. However, the key to future GDP growth is not an increase or improvement in resources (including labor) but in technology that improves productivity. 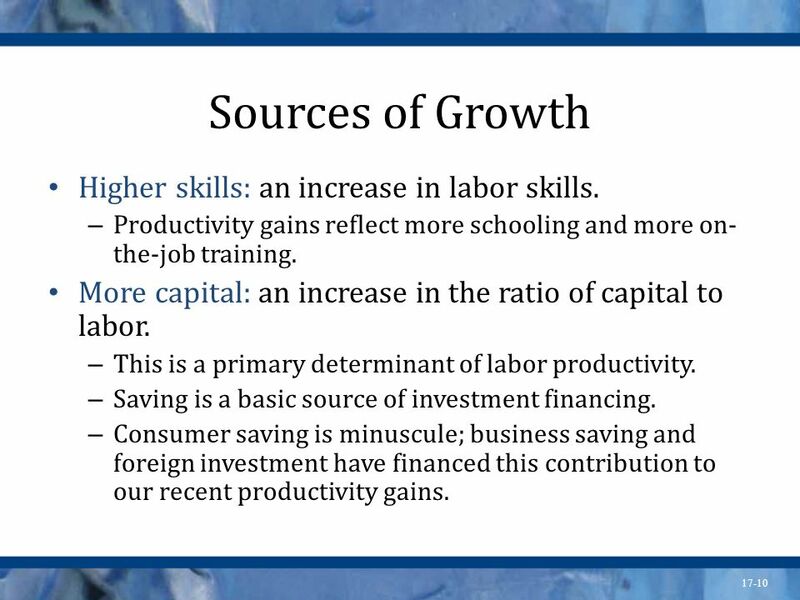 10 Sources of Growth Higher skills: an increase in labor skills. Productivity gains reflect more schooling and more on-the-job training. More capital: an increase in the ratio of capital to labor. This is a primary determinant of labor productivity. Saving is a basic source of investment financing. Consumer saving is minuscule; business saving and foreign investment have financed this contribution to our recent productivity gains. This trend is ongoing. High-skill jobs increase in number while low-skill jobs decrease in number. You might want to do a bit of career advising right here. The recent trend in increased saving may not last, but it does provide an increase in available funds. The problem here is that the enormous uncertainty facing prospective investors is inhibiting the use of those funds for growth. 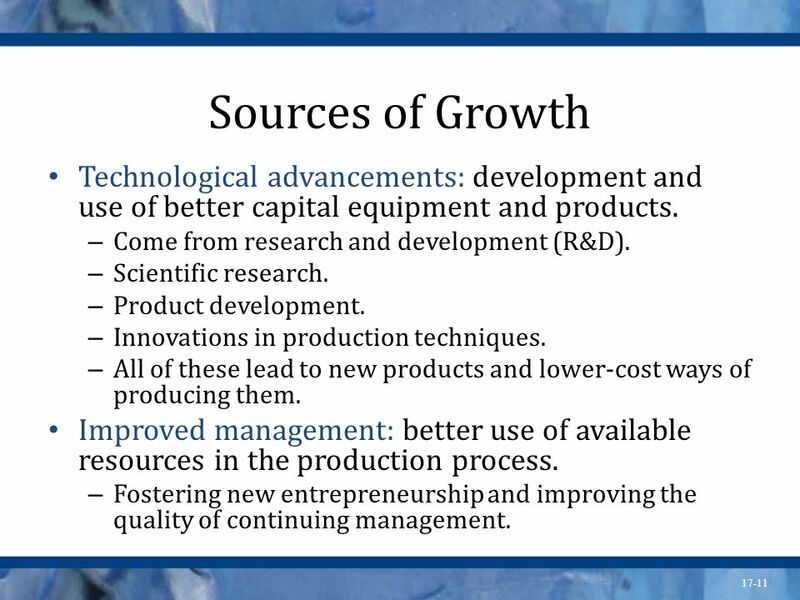 11 Sources of Growth Technological advancements: development and use of better capital equipment and products. Come from research and development (R&D). Scientific research. Product development. Innovations in production techniques. All of these lead to new products and lower-cost ways of producing them. Improved management: better use of available resources in the production process. Fostering new entrepreneurship and improving the quality of continuing management. The key to future growth rests with technology and putting technology to use. 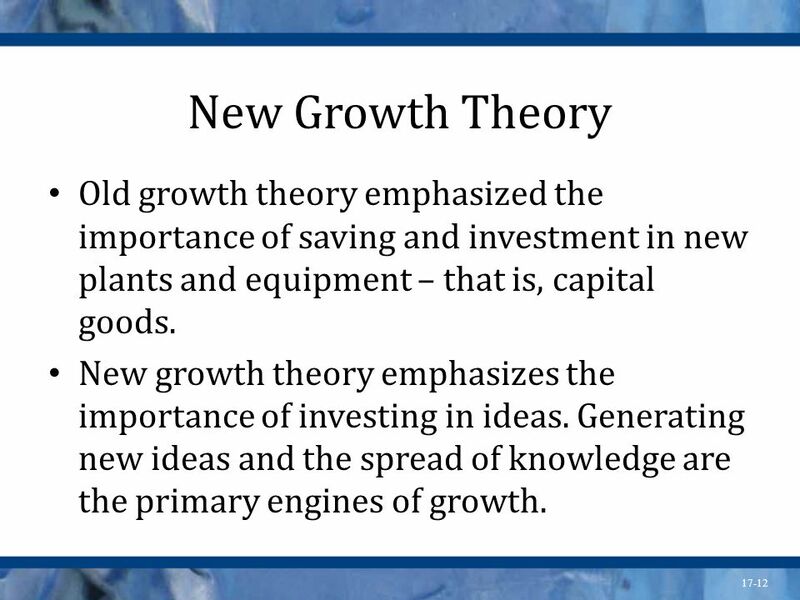 12 New Growth Theory Old growth theory emphasized the importance of saving and investment in new plants and equipment – that is, capital goods. New growth theory emphasizes the importance of investing in ideas. Generating new ideas and the spread of knowledge are the primary engines of growth. The business of America is rapidly transforming from metal-bending to ideation. One of the leading new growth theorists is Paul Romer. 13 Policy Tools Increase human capital investment. Improve the quantity and quality of investment in education. Encourage employment-based immigration, particularly of those with skills in short supply. The immigration aspect is a touchy one. Currently immigration policy allows a lot of people coming in because of family connections but restricts high-skilled people from entering. Also, the inability to stop illegal immigration lets huge numbers of lower-skilled workers in. 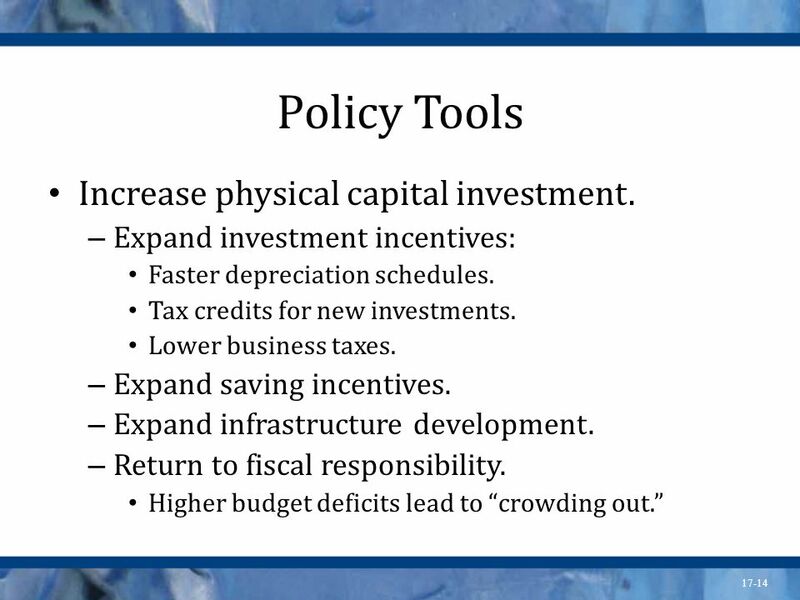 14 Policy Tools Increase physical capital investment. Expand investment incentives: Faster depreciation schedules. Tax credits for new investments. Lower business taxes. Expand saving incentives. Expand infrastructure development. Return to fiscal responsibility. Higher budget deficits lead to “crowding out.” We covered this under supply-side policy. 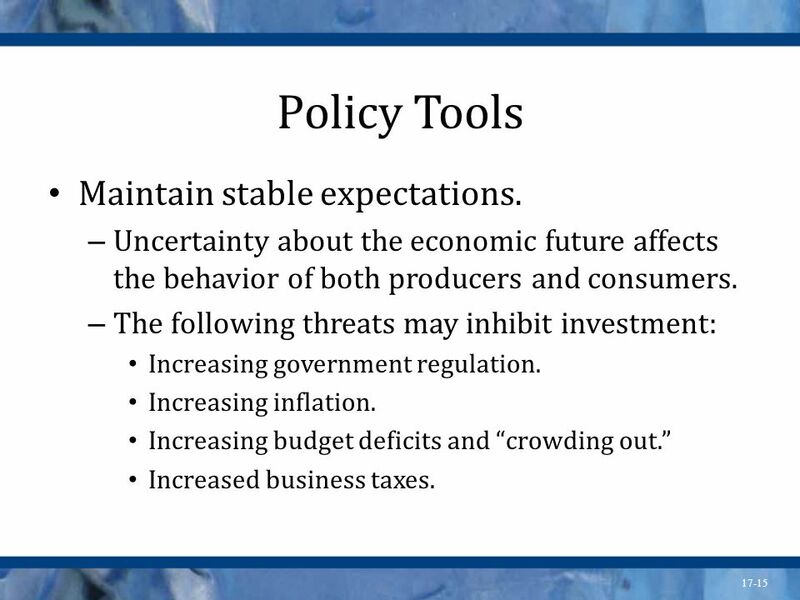 15 Policy Tools Maintain stable expectations. Uncertainty about the economic future affects the behavior of both producers and consumers. The following threats may inhibit investment: Increasing government regulation. Increasing inflation. Increasing budget deficits and “crowding out.” Increased business taxes. If the status of regulation, inflation, deficits, and business taxes were known and predictable, the private sector would adapt and economic growth would continue. However, growth would be less if any or all of these were adverse. 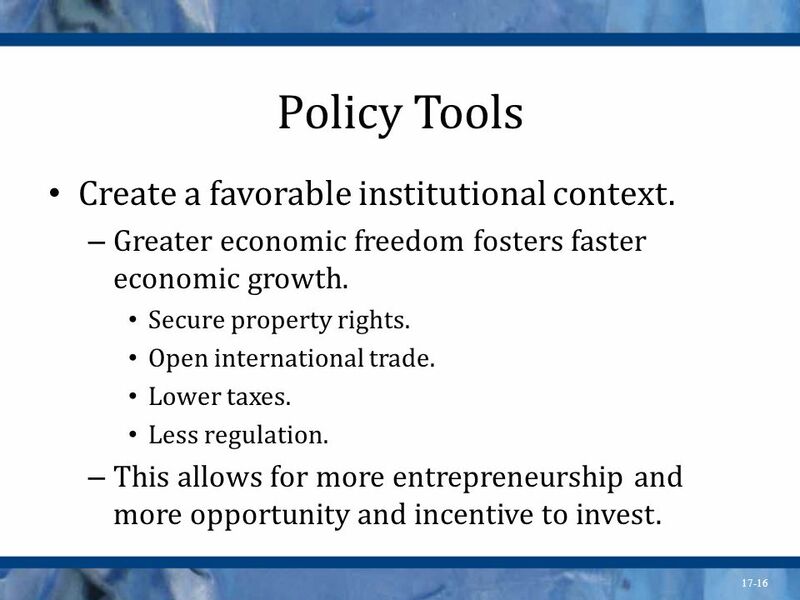 16 Policy Tools Create a favorable institutional context. Greater economic freedom fosters faster economic growth. Secure property rights. Open international trade. Lower taxes. Less regulation. This allows for more entrepreneurship and more opportunity and incentive to invest. Less restrictive government makes economic growth more likely. 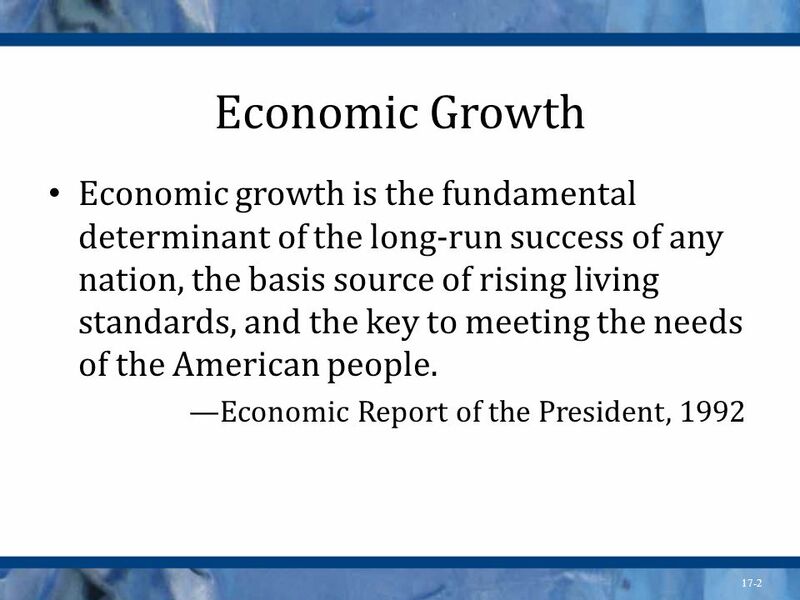 Download ppt "Economic Growth Economic growth is the fundamental determinant of the long-run success of any nation, the basis source of rising living standards, and." The Debate John Maynard Keynes challenged the classical assertion that the economy would self-adjust to full employment. Keynes said that there would be. Aggregate Demand and Aggregate Supply 29 McGraw-Hill/Irwin Copyright © 2012 by The McGraw-Hill Companies, Inc. All rights reserved. Chapter 8 Unemployment Copyright © 2010 by The McGraw-Hill Companies, Inc. All rights reserved. McGraw-Hill/Irwin. Copyright McGraw-Hill/Irwin, 2005 Legislative Mandate Fiscal Policy and the AD-AS Model Expansionary and Contractionary Fiscal Policy Financing. Copyright McGraw-Hill/Irwin, 2005 Aggregate Demand Changes in AD Determinants of AD Aggregate Supply Determinants of AS Equilibrium & Changes in. Copyright McGraw-Hill/Irwin 2002 Aggregate Demand Derivation of the AD Curve Changes in AD Determinants of AD Shifts in AE Schedule and Curve Aggregate. 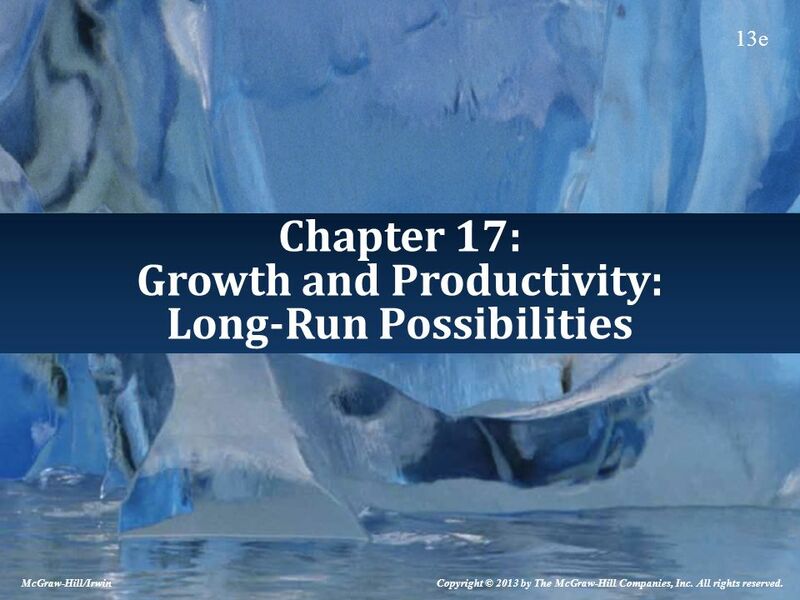 15 CHAPTER Growth, Inflation and Cycles © Pearson Education 2012 After studying this chapter you will be able to:  Define economic growth rate and explain. 1 Productivity and Growth Chapter 21 © 2006 Thomson/South-Western. ECO 104: Introduction to Macroeconomics Lecture 10 Chapter 17: Economic Growth 1Naveen Abedin.